This online game looks like so much fun, but I’m having a hard time getting past Level 1! 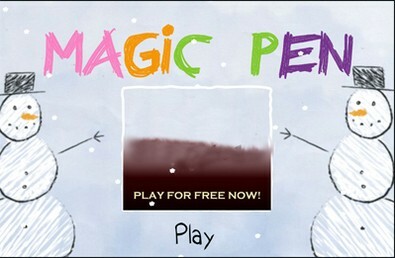 Magic Pen is entirely interactive… and very challenging. So much so, that you can’t get far until you can figure out a way to “draw” objects and widgets that will propel the red ring far enough to move into the next level. To get started, wait for the word “play” to appear at the very bottom of the screen. Then, click and follow along with the brief tutorial that starts automatically and shows you your options for propelling the red rings throughout the various levels of the game. Good luck!